This week’s blog is taking a cue from Beyond Basics’s move into their beautiful new space, and PT Riva Preil’s recent blog on squatting. We have all heard the instruction to “lift with your legs and not with your back.” However, without proper hip joint mechanics, differentiating your back from your legs may not be possible. In Pilates we have a series of movements called footwork, which mimic the motion of squatting while encouraging healthy joint movement. 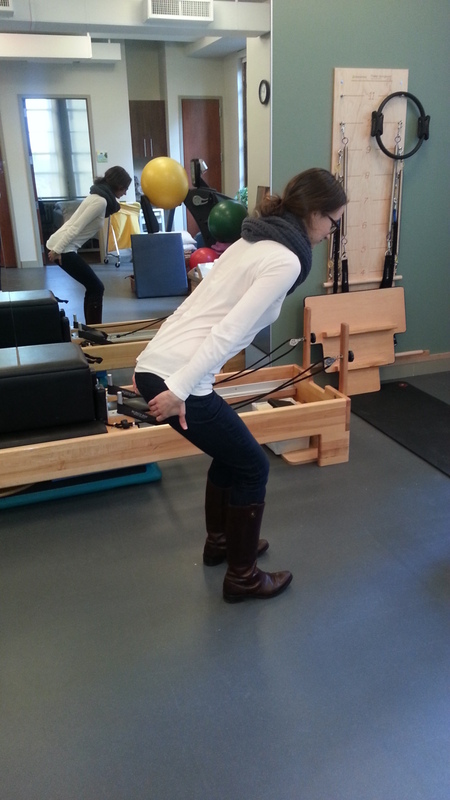 Footwork is traditionally done on the Reformer, but it can also be performed standing. Before we begin, we’ll review the boney landmarks of the pelvis. Stand with your feet as wide as your shoulders and put your hands on your hips. Now, slide your ﬁngers down and in towards your pubic bone. The soft area on either side of your pubic bone is your hip joint, where your thigh bones join your pelvis. Keep your ﬁngers there, while you lift your knees one at a time. Feel the movement of your thigh bone rolling back as you lift your leg, and rolling forward as you lower your leg. Next, put your ﬁngers on the back of your legs, where the top of your leg meets your buttocks. This is referred to as your gluteal fold. Keep your ﬁngers there as you sit back into a squat position and feel your sitz bones move away from each other. Then, as you stand up, feel your sitz bones move toward each other. Now, with your hands on your hips, we’ll imagine both movements happening at the same time. To begin, take a deep breath. As you inhale, squat. Imagine your sitz bones widening and your thigh bones rolling back in the hip joint. As you exhale, stand up. Imagine your sitz bones narrowing and your thigh bones rolling forward in the hip joint. Repeat this action ten times, remembering to breath as you move. 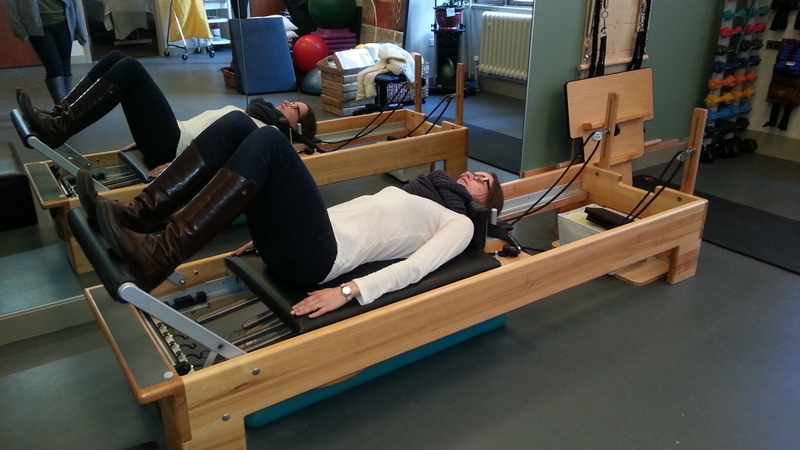 If you would like to try this movement on the reformer, call Beyond Basics and schedule an appointment with me. I am at the ofﬁce on Thursday mornings.